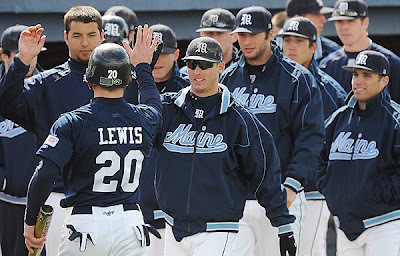 The Maine Black Bears Baseball Team Split 2 double headers against Sacred Heart over the weekend, losing 2 on Saturday and winning 2 on Sunday. Maine is 12 - 9 on the season and in 1st place in America East. No one has played any conference games yet. The Maine Black Bears Softball team had a fantastic weekend winning 3 games. On Saturday, Maine beat Boston College 5 - 4. They had an even better day on Sunday, sweeping both games against Bryant. The Portland Pirates dropped their 3rd straight game, losing to the Bridgeport Sound Tigers 4 - 3 Sunday. The loss drops the Pirates to 4th place in the Atlantic Division. The Lewiston MAINEiacs head back home down 2 - 0 against the Drummondville Voltigeurs in the QMJHL Playoffs. Game 3 is tomorrow at the Collisee.